2018 was a year of celebrations for the Bourret Group. After 90 years of constant work and devotion, we all came together between colleagues to highlight the dedication of everyone. Some retirees even joined us for the occasion. On November 17, together, we celebrated our daily accomplishments. The main organizational challenge was to set up an unforgettable event for more than 650 people. However, expectations have been successfully met, thanks to the contribution of several great partners. Upon arrival, the guests were immersed in a vintage carnival atmosphere. Thanks to the presence of several actors in the reception area. Thus, the bearded woman, the strong man and the master of ceremony were all present to welcome all of our guests. Some were happy to see our mysterious characters, others were surprised. Admittedly, they did not leave anyone indifferent! Upon entering the room, the evening began with a cocktail reception. It was the perfect opportunity to interact with colleagues that we do not meet often enough. The guests had the chance to leave with their photography, since two photo booths were on hand to capture these beautiful memories. In addition, a fortuneteller wandered through the crowd to entertain our guests, not to mention the presence of an excellent cartoonist. A little over an hour after their arrival, we invite the guests to take their seats at their table. It was at this moment that our host Maxime Charbonneau and his DJ Dominiq Hamel entered the track to launch the evening. Quickly, they left their place to Nicolas, Valérie, Maxime and François Bourret. The four members of the Bourret family went with a speech full of history, anecdotes, but especially a speech that wanted to be a unifying one. The thanks to the employees were many, and they were well received as an ovation concluded this moment. Maxime Charbonneau, our animator, has throughout the evening brought employees on the stage to participate in various games. However, it was François Bourret who started the ball. Indeed, what happened on the stage is a well-kept secret! In addition, before each meal our chef Jonathan Garnier came to present his dish, followed by Jean-Bernard Drolet, sommelier, who presented us the matching wine. Thus, between each service, we were entitled to animations more fun and more surprising than the others. To complete the meal portion of the evening, Maxime Charbonneau invited several of our employees on stage to accomplish different challenges. It was also the end of the last challenge that led to the dance party and it was here that everyone was able to let go their crazy on the dance floor, until the end of the evening! A few weeks after our celebrations, we are still grateful to have been part of such a wonderful and warm event. 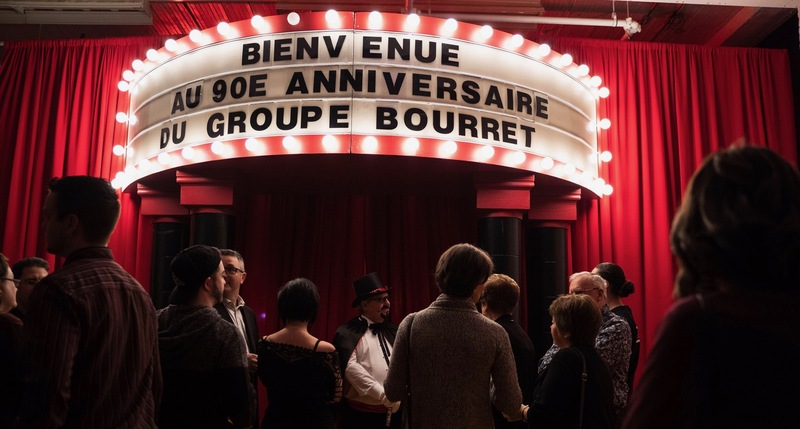 Once again, HAPPY 90th ANNIVERSARY TO BOURRET GROUP!